Granite hearths are very hard wearing and have a durable gloss finish. 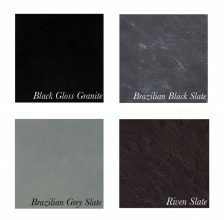 The most common black granite in use today is sourced from China in various sizes up to 60 inches x 20 inches. Larger sizes are available but are most commonly made from multiple smaller pieces. The Leeds Stove Centre can supply two basic types of Hearth – the Slabbed Tiled Hearth and the Polished Granite Hearth. All come in a variety of sizes from 36 inch to 60 inches wide and a range of depths to suit any fireplace setting. These are available for use with solid fuel as they are slabbed with a mixture of cement and vermiculte and incorporate expansion slots. This is to meet building regulation requirements as the granite will expand and contract due to the intense heat a solid fuel burner can emit. There are generally three types of granite hearths – straight, curved and tongued. All of these hearths are cut from a single slab of granite and polished. Standard Granite hearths are not suitable for use with solid fuels as the intense heat generated may cause cracking – gas fires are the preferred option. These are available for use with solid fuel or gas as they can be slabbed with a mixture of reinforced concrete and vermiculte and incorporate expansion slots. This is to meet building regulation requirements as the material will expand and contract due to the intense heat a solid fuel burner can emit. Available in Granite or Basalt. These are available in either a smooth or riven (ribbed) finish. Very strong and easy to keep clean. A sheen can be added with the use of slate oil or WD40.